Autonomous cars will also know which routes to use to save fuel, will monitor traffic flows in a way that consumes less fuel, and won’t ever do jack-rabbit starts. Maybe this future scenario doesn’t sound as fun or entertaining, but computer technology in cars is reaching the point where you’ll sit back and relax, possibly reading a book and checking email. It makes sense then that the robotic tech will also know how to drive in a way that’s far greener and saves you money at the pump. 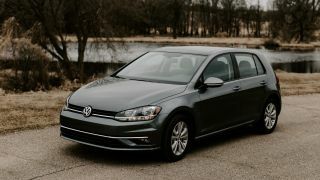 Until then, the 2019 VW Golf SE includes an interesting feature called Think Blue that helps you drive more economically. It’s a sign of how robotic tech might perform some of these actions for you in the near future. As you drive, the panel shows a score for how you are driving in real time. There’s also an indicator for when you should shift (since the Golf SE has a manual transmission) from one gear to the next, and your current MPG. If you tap on the left gauge for your score, you can see a graph for how you’ve been driving recently in the last 30 minutes. You can compare the results from that time you drove like a maniac to work and when you were in more of a leisurely driving mood. On the gauge to the far right, you can also see a graph for MPG level over recent drives. Other than the fact that the name might be confusing (the name Think Blue is a reference to the VW logo, but the name Think Green would have made more sense), I liked how the system worked because I was able to pull up the screen for every drive, and there’s a sense of challenging yourself as you drive and thinking about whether you are burning through fuel faster. My top score of 92 was only possible when I gingerly shifted into gear as prompted, drove slow and steady, and didn’t over-brake. There’s a long list of other tips in the car, including turning off the fog lights to save energy and turning off the AC. Some of those settings would have a marginal impact, so it’s more for peace of mind. In an electric car, disabling some of the climate settings and turning off all lights can help you extend the range and, in theory, also help save the planet because you won’t have to charge up the car as often. That said, my typical score was more like 65 because, since autonomous cars are not quite ready for full deployment, I’m still in charge and the Golf SE has a turbocharged engine. It’s possible I drove a little more sensibly though, aware of my sporty inclinations. I kept thinking about how future cars will do all of these things on their own and how we can focus on other things. With a tap of a button, we could instruct a future VW Golf to drive on its own and save as much fuel as possible. That means we won’t have to think about fog lights, and the car will deal with any traffic issues all on its own. Overall, Think Blue is a helpful aid. It’s easy to use and a good reminder about driving with more awareness about how much fuel you are using and how you are driving.